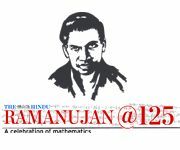 The on-again-off-again news of a hollywood movie on the life of mathematical genius Ramanujan has resurfaced again. This time, with little more details that Tamil actor Madhavan will play the lead and that the movie will be titled ‘The man who knew infinity’ after Robert Kanigel’s Ramanujan biography. Personally, I will hate to see a glamour man like Madhavan playing Ramanujan. Besides he is too old for that. But let the shooting first start. I have heard the news on Ramanujan’s biopic too many times to believe.